Creating and storing customers in your cloud-based apps is a necessary first step. But if you were using several such apps to run your business, then that step becomes redundant. A lot of businesses use the time-wasting import/export method, but your app is never really up-to-date. Chargebee’s suite of integrations now includes PieSync that allows you to sync customer contacts bidirectionally, between Chargebee and your favourite app real-time. PieSync syncs your contacts 2-way and in real-time between your favorite cloud apps. On an average, small and medium businesses use 13+ cloud apps at the same time, for various tasks. Exporting and importing customer contacts for each of these apps can be cumbersome. With the PieSync integration, you can simply connect your apps, while the contacts are created and synced across different apps instantly. Siloed data across different teams and functions can lower the impact on business decision-making, with lack of available shared customer information. PieSync allows you to sync across accounting, sales, marketing, and customer success platforms. Visit PieSync to learn more about setting up this integration. Do I need a paid account in PieSync to sync contacts between Chargebee and another app? How frequently does PieSync sync contacts between Chargebee and any other app? Can I sync Accounts, Organizations, Companies, Invoices, Deals, Tasks, Opportunities etc.? This integration is available across all plans in Chargebee, and you can sign up for our Launch Plan (that allows you to use Chargebee for free up to first $50K in your aggregate revenue). 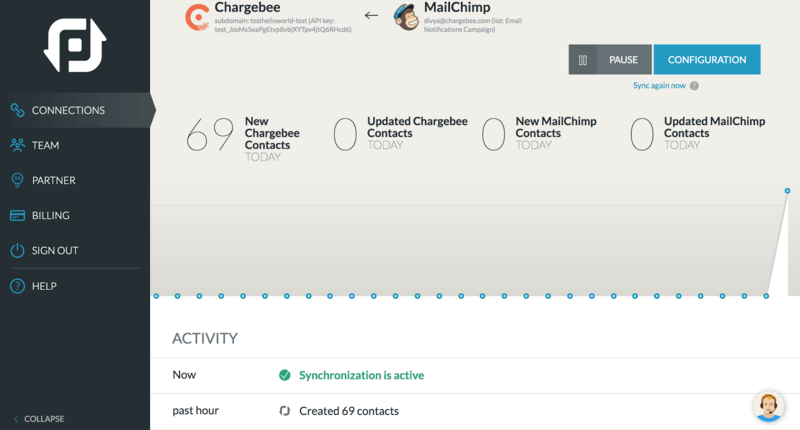 Chargebee syncs contacts real-time with your app using PieSync. No, PieSync only syncs contacts between your apps and Chargebee. Yes. If PieSync supports custom fields for the apps you have connected, you can map them via custom mappings. More information on custom mappings here!